This week, Senator Cory Booker (D-NJ) introduced the Simplifying Financial Aid for Students Act of 2014, with the goal of streamlining the federal financial aid application process for students from lower- to middle-income families. This legislation has two main parts, which I’ll examine separately in this blog post. The first part is to allow for the use of “prior prior year” (PPY) financial data to determine a student’s eligibility for financial aid. Legislation to allow PPY was introduced in the House last year, but has not yet seen any substantial action. If PPY were law for next academic year, tax data from 2012 would be used instead of data from 2013 to determine 2014-15 eligibility. My research on PPY conducted with student-level data from nine colleges provided by the National Association of Student Financial Aid Administrators (NASFAA) suggests that PPY wouldn’t substantially change Pell Grant awards for about three in four students. However, it does have the potential to increase program costs, particularly if students are induced to attend college by getting earlier information about college costs. In an ideal world, I would use student-level FAFSA data from 2012-13 (when the automatic zero EFC cutoff was $23,000) and examine the EFC distribution among students with household incomes between $23,000 and $30,000. 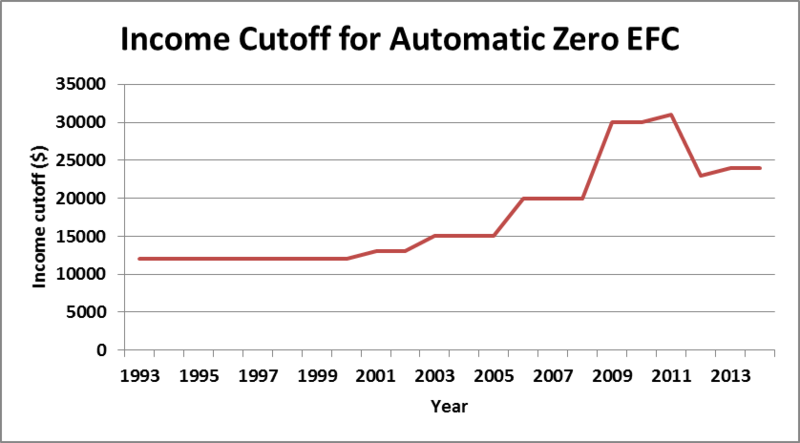 However, the most recent national data are from 2011-12—when the cutoff was $31,000. This means the best national data that can be used is the National Postsecondary Student Aid Study (NPSAS) with college students from 2007-08. Instead of the NPSAS, I use data provided by nine colleges and universities to NASFAA for the previously mentioned study on PPY. 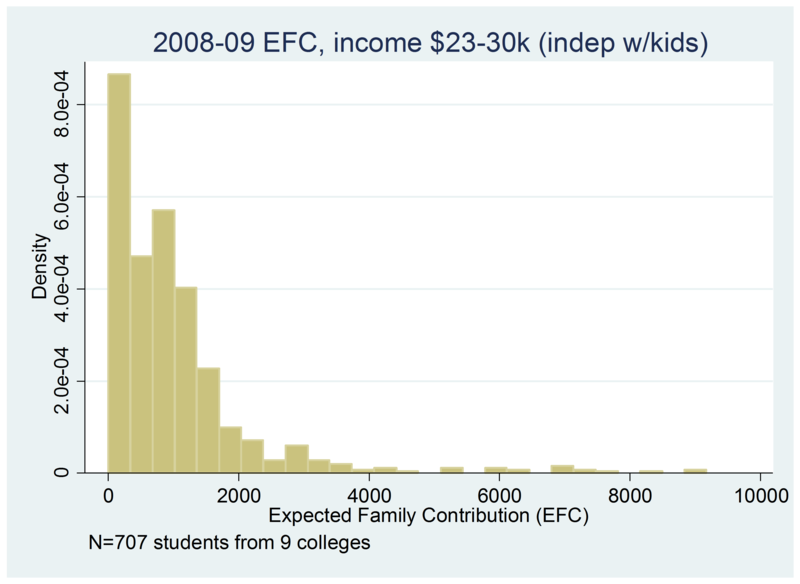 The dataset includes FAFSA components and EFCs from the 2007-08 through 2011-12 academic years, and I use the 2007-08 and 2008-09 academic years in this analysis as the maximum income for automatic EFCs was $20,000 in these years. I focus on students with incomes between $23,000 and $30,000 resulting in 5,214 observations for dependent students and 1,449 observations for independent students with their own dependents. The below charts show the distribution of EFCs by dependency status and year among students who would likely qualify for an automatic zero EFC under Sen. Booker’s proposal. Note that the maximum EFC that would make a student Pell-eligible was just over $4,000 during these two years. About one in six students in my sample with a household income between $23,000 and $30,000 had a zero EFC in 2007-08 or 2008-09, a period when the automatic zero EFC cutoff was $20,000. Nearly 95% qualified for a Pell Grant, and the median EFC was around $900. These data likely understate the percentage of students with a zero EFC, as somewhat increased income deductions on the FAFSA since 2009 would result in lower EFCs for some students. This is a relatively quick analysis, but it does suggest that Sen. Booker’s proposal to raise the automatic zero EFC cutoff to $30,000 wouldn’t substantially change the Pell Grant awards of many students. I would be curious to see the Congressional Budget Office’s cost estimates for the proposal, but my guess is that they’re not tremendously large. Next Next post: It’s PIRS Prediction Time!